Joe Root and Jos Buttler carried England to a much-needed five-wicket victory in the third one-day international against Sri Lanka. 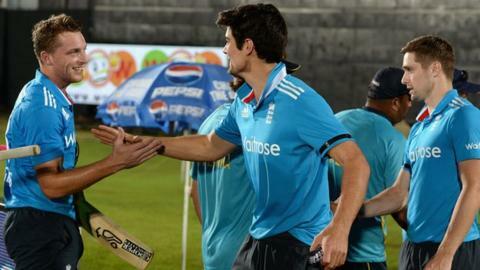 Chasing 236 in 35 overs, England were wobbling on 152-5 despite a good start by Moeen Ali and Alastair Cook. But Root (48 not out) and Buttler (55 not out) shared 84 in 10.3 overs to see England home with eight balls to spare. Sri Lanka, who lead the seven-match series 2-1, earlier reached 242-8, with Lahiru Thirimanne making 62 not out. That came after Kumar Sangakkara compiled 63 to become only the fourth man to pass 13,000 runs in one-day internationals. The win - only England's eighth in the past 23 completed ODIs against Test-playing sides - will slightly ease the pressure on captain Cook, who faced calls to stand down after a heavy defeat in the second match. A hint of fluency in his 42-ball 34 should also please the England skipper, although a slow over-rate could lead to a suspension which would rob him of the opportunity to build on the shoots of recovery. A wayward bowling performance and a middle-order collapse of three wickets for eight runs in nine deliveries will also provide cause for concern, but, thanks to Root and Buttler, England can celebrate a morale-boosting win which comes with only eight matches to play before the World Cup begins on 14 February. On Twitter: "When struggling, it's all about getting over the line. Not pretty, but England needed that. Not sure where they might have gone otherwise." Coming together with 84 needed from 71 balls, the sixth-wicket pair absorbed Sri Lanka pressure that pushed the requirement to 50 from the final five overs, then accelerated to such a degree that, in the end, the winning margin was comfortable. Root, who was caught at mid-off from a Dhammika Prasad no-ball, nudged and scampered, while Buttler powerfully took advantage when the Sri Lanka bowling became ragged. They ensured that the earlier good work done by Moeen and Cook was not wasted, the England opening pair building a stand of 84 at a rate of better than seven an over. Cook, who has only one ODI half-century since the summer of 2013, drove sweetly down the ground, while Moeen's mix of languid lofts over the off-side fence and powerful heaves to leg brought him five sixes in his 58. But, when Cook feathered Prasad through to wicketkeeper Sangakkara, it began a sequence that put England in jeopardy thanks to their own profligacy. Alex Hales, recalled to bat at number three in place of Ian Bell, was guilty of ball-watching to run out Moeen, and the Nottinghamshire man then holed out to mid on off the bowling of Angelo Mathews. Ravi Bopara, promoted to number five, was brilliantly caught down the leg side by Sangakkara, before the out-of-form Eoin Morgan top-edged Mathews to long leg. However, bar the wobble, England's batsmen masked a bowling effort that too often failed to master the basics of line and length. Chris Woakes and Steven Finn had Sri Lanka to 31-3 either side of a two-and-half-hour rain break that reduced the match and caused England's target to be adjusted, but Sangakkara and Mathews consolidated before Thirimanne accelerated. In omitting Harry Gurney and the off-spin of James Tredwell in favour of Chris Jordan and Ben Stokes, England looked for seven overs from Stokes, Root and Bopara, which cost 73 runs. Sri Lanka also managed to add 62 in the final five overs of their innings but, in the end, it was not enough.